Despite the conspicuous handicap of being a scion of Hungary’s best-known aristocratic lineage in a communist-ruled society, Péter Esterházy, born in Budapest in 1950, had already acquired the rank of one of the greatest living Hungarian writers, enjoying virtually unparallelled popularity with Hungarian readers and critics alike, a decade before the final fall of the old régime. His first stories appeared in 1974, the year that he graduated with a degree in mathematics. 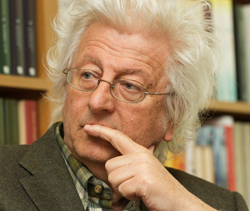 His first novel, Termelési regény (Novel of Production, 1979), was hailed on its appearance as a model of postmodernism in Hungary for the experimental verve and self-reflexiveness. This was followed by the magisterial, and perhaps even more radical, Bevezetés a szépirodalomban (Introduction to Literature, 1986) and a string of subsequent works, parts or all of which have been translated into numerous languages.